You've entered an enormous building scoured by ocean tides and haunted by hulking machines, slowly rusting away. 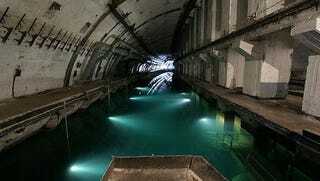 It looks like the set for a post-apocalyptic movie, but it's actually a real-life Soviet submarine base, left over from the Cold War. Liepaja, an ice-free harbor in the Baltic Sea, once a submarine base for 16 submarines and a nuclear deposit. There was also a closed town named Karosta.